NASCAR issued an L1 level penalty Tuesday to the Chip Ganassi Racing No. 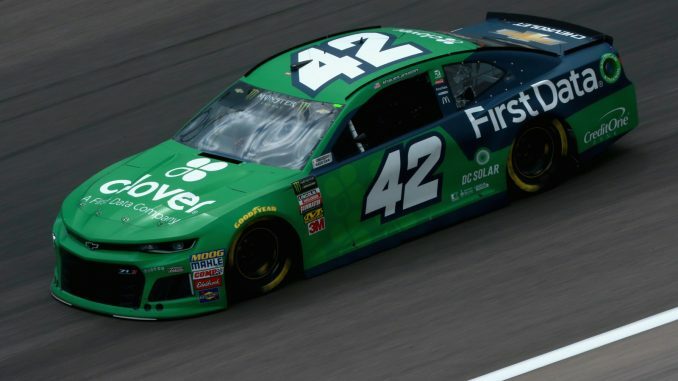 42 Chevrolet team of Kyle Larson due to an improper rear window support found in post-race inspection after Saturday night’s race at Kansas Speedway. The sanctioning body said the team was in violation of Sections 20.4.h (vehicle body) and 20.4.8.1.b&c (rear window support and structure) in the 2018 NASCAR Rule Book, with the rear window not flush to the rear deck lid and the rear window support braces not keeping the rear window glass rigid in all directions. No. 42 crew chief Chad Johnston was fined $50,000, and car chief David Bryant was suspended from the next two points-paying events on the Monster Energy NASCAR Cup Series schedule. Bryant will be available this weekend at Charlotte Motor Speedway for the non-points Monster Energy NASCAR All-Star Race. After Saturday’s race Larson seemed to feel that the window issue was a result of late race contact with Ryan Blaney. NASCAR executives however had different view. Scott Miller, NASCAR Senior Vice President of Competition, told NASCAR.com the violation was similar to other technical infractions found earlier in the season. Those punishments included penalties for a bowed roof on the Las Vegas-winning No. 4 Ford of Kevin Harvick in March, and last week’s sanctions to the No. 14 and No. 19 teams for similar unapproved bodies earlier this month at Dover. The penalty erases the playoff point Larson earned with his stage win at Kansas. The team was also docked 20 points from the drivers’ and car owners’ standings. Pending a possible appeal, that penalty would drop Larson from 10th to 11th in the Monster Energy Series points. Larson led a race-high 101 laps and finished fourth in Saturday’s KC Masterpiece 400. Ganassi will not appeal the penalty and has not yet decided on a replacement car chief. “Although all parties agree that the infraction was unintentional and the result of contact, we will not appeal the penalty so that we can focus our energy on the All-Star race and the Coca-Cola 600,” the team said in a statement. NASCAR also announced that the No. 22 Ford Team Penske team and driver Joey Logano was penalized for having one lug nut not safely and securely mounted in a post-race check. Competition officials issued a $10,000 fine to No. 22 crew chief Todd Gordon for the safety infraction.